Size? 2' Wide, 6' Long, 15mm Thick, or roughly 3/5"
A workout mat can be quite useful. The best ones can be used for everything from Yoga to a padded area for your work station. 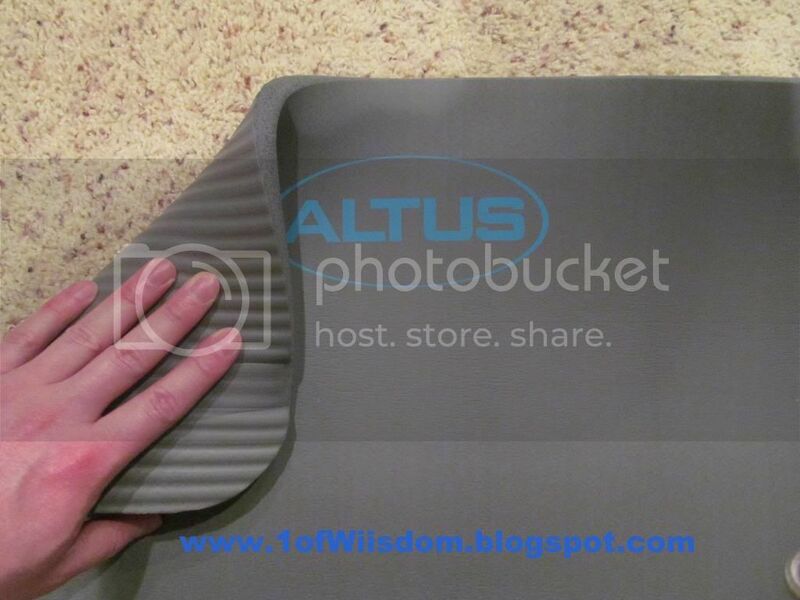 The Altus Athletic Gray Workout Mat is truly one of the best I have ever seen. I would venture to guess the size is ideal for the vast majority of the population. Even those who are 6'6" or taller can still make use of it and just have your feet off for crunches or floor work etc. If your shoulders are somehow broader than 2 Feet, you likely don't do much floor work...If so, you have a few options...deal with it, or buy another mat. Carrying on with the ideal floor size, we have to factor in the utility. There are a lot of mats, or square tiles you can throw down, but not all are equal. If you are tight on space, this Altus mat rolls easily for storage. You can workout in your apartment's living room Saturday morning, roll it up, and entertain Saturday night without any trace that your living area was serving as a gym 4 hours ago. Similarly, if you are working out in the garage, or a basement, the mat can roll up out of the way for other events, or to simply make room for your car. I realize, not everyone will utilize the mat like this, but the first time I was laying on it, I was thinking what a great pit mat it would be! I bought a folding pit mat last year and love it. When I need the extra clearance I don't have with a standard creeper, the floor mat often provides the extra little bit to get up under the car and access a drain plug, connection, bolt etc. I have really enjoyed the pit mat for taking lug nuts off...If you are swapping tires for the season, sticking slicks on for the track, or servicing your brakes, the extra leverage you get with a floor mat over the creeper is nice...And it sure beats the pounding this puts on your knees! The other use for a shop space is to treat it as an anti-fatigue mat...rather than spend $75 for those thick rubber mats, you could get 3 of these and be set! The mat comes with a black carrying strap that features two loops on the end that are elastic. This allows you to roll the mat up (loose or tight), fix the elastic loops over it, and easily carry it with the handle/shoulder strap. The mat itself is a nice neutral gray. One side is ribbed (length wise) and the other is smooth and features the Altus logo. Where this mat really stands apart is the thickness. While that $9.99 mat online or at Walmart may seem like a steal, it is likely paper thin. Before you get wrapped up in the color (bright green, pink, etc), feel it. Then compress the mat between your fingers. Did it easily compress? Did the mat spring back to original thickness, or did it stay dimpled? If that is pressure you generate between two fingers, think what the mat will do when you are standing on it, or laying down to do crunches. You want the mat to COMFORT you, not just look neat while you curse the lack of function. While that may stop you from spending $10 on the bargain mat with a nice design, that by no means suggests you need to spring for the top of the line workout mat with a big name or celebrity endorser. 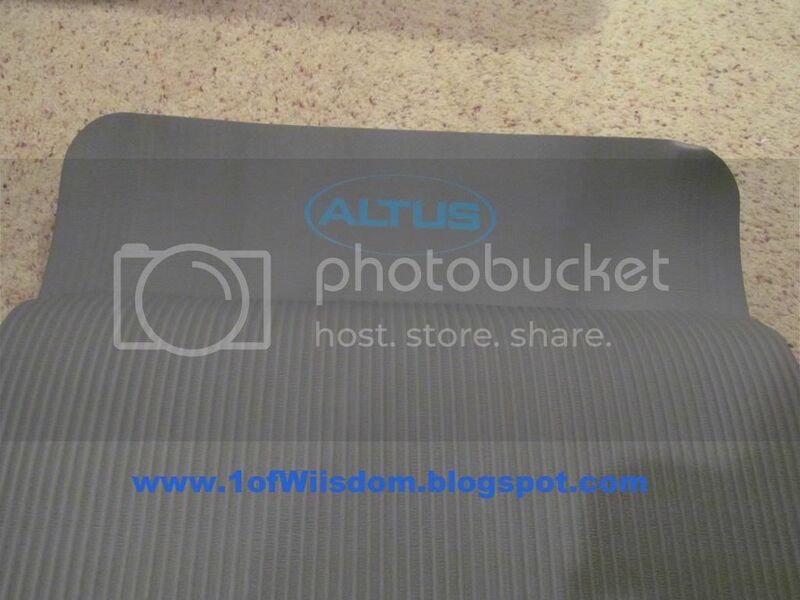 I would challenge anyone to find an expensive mat (ie $50 plus) that this Altus mat couldn't go toe-to-toe with. 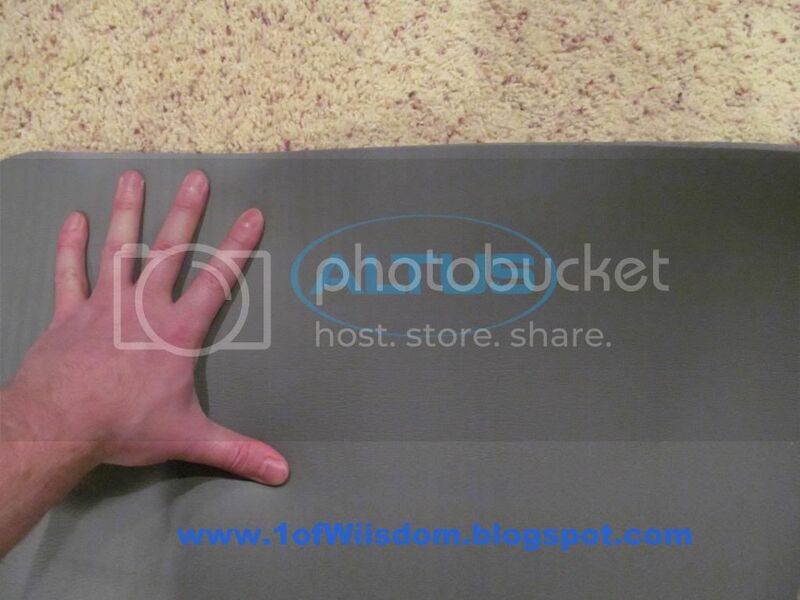 At this price point ($25) you are getting the best of both worlds: A high-quality, long lasting mat at a killer price. I have a few of those "thin mats" and while they are a slight upgrade over concrete, you will know it is there...I wound up using them under a weight machine. If you are doing Yoga or Pilates you will love this mat. It will be a huge upgrade over a solid surface or even carpet or an area rug. 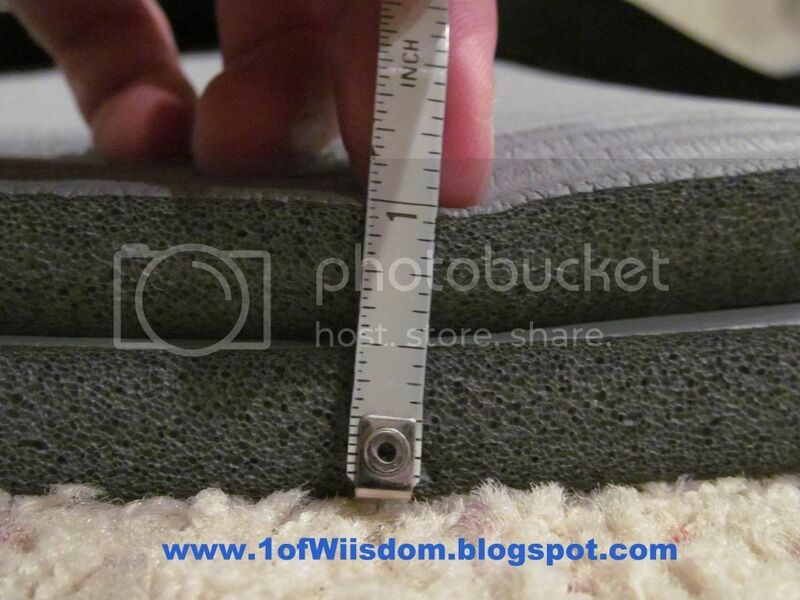 The 15mm Foam (that is over a half-inch thick folks) provides tons of support...and it springs back. I bought this mat not for the garage (although I think I will get one for that purpose), but for Insanity. I could tell from the infomercial it would feature a lot of high-impact moves and exercises...that is correct! I can not imagine going thru Insanity without this mat! I actually ran out-of-town just into Insanity and believe it or not, I took the DVDs with me. That night at the hotel I plugged in Plyometric Cardio and it was very rough on me...the hotel carpet is basically just a stain catcher above concrete...I definitely missed this mat...And that made me realize what a true value the mat was. If a product works and is priced right, it should be supported. If you workout with this mat for a week and then stop, you will miss it...That is the sign of a good product. If I wind up going out-of-town again before the 60 Days are up, this mat is coming with me! That speaks volumes. I highly recommend this mat. I can't think of a possible use where it would disappoint. It is far superior to similarly priced units I have seen and had first hand experience with, yet on the flip side it is just as good as the expensive mats. This is a great piece of versatile equipment at a great price. I've had nothing but compliments on it and I plan to continue to enjoy working out with it for years to come!